Get great printing results at one of the best deals on the web. Our Epson Universal compatible ribbons give top quality printing results from your business’ point of sale systems. Our Epson Universal ribbons come in 30, 34 and 38 as boxes of six with your choice in color. Epson 30/34/38 Universal box of 6 ribbons, R918 (choice of color) for EPSON ERC30, ERC34, ERC38, ITU200D, 270, 300D, M133A, M17-JB, M188B, M119, M119B, M270, M280, M52-JB, TM-267 II, TM-270, TM-300A, TM-300C, TM-300D, TM-U200B, TM-U200D, TM-U210A, TM-U210AR, TM-U210B, TM-U220, TM-U220A, TM-U220B, TM-U220D, TM-U230, TM-U300, TMU-300A, TM-U300B, TM-U300C, TM-U300D, TM-U325, TM-U370, TM-U375, U300A, U300B, U300C, U300D and many others. 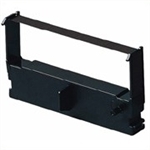 Universal Epson ribbons come in cases of 6 ribbons and work with: EPSON ERC30, ERC34 & ERC38; ITU200D, 270 & 300D; M133A, M17-JB, M188B, M119, M119B, M270, M280 & M52-JB; TM-267 II, TM-270, TM-300A, TM-300C, TM-300D, TM-U200B, TM-U200D, TM-U210A, TM-U210AR, TM-U210B, TM-U220, TM-U220A, TM-U220B, TM-U220D, TM-U230, TM-U300, TMU-300A, TM-U300B, TM-U300C, TM-U300D, TM-U325, TM-U370 & TM-U375; U300A, U300B, U300C & U300D and many more. The Epson ERC-31 ribbon comes in packs of 6 and works with the ERC-30 and the ERC-38. These cartridges give top quality results and exceed OEM standards. If you have a question about using one or our Epson ribbon cartridges, contact us at 1-866-748-8273.